The global expansion of participation rates in higher education continue more or less unabated. However, while the concept of lifelong learning has figured prominently in national and international educational policy discourse for more than three decades, its implications for the field of higher education has remained relatively underdeveloped. 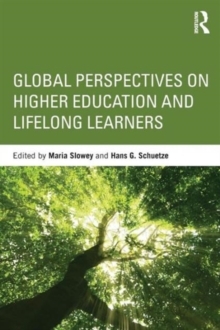 This book focuses on a particular dimension of the lifelong learning: higher education for those who have not progressed directly from school to higher education. Some will embark on undergraduate programmes as mature students, part-time and/or distance students; others wish to return to higher education after having completed (or not completed) a previous academic programme, while increasing numbers participate in postgraduate and continuing studies for a complex mix of professional and personal reasons. Adopting a comparative and international longitudinal perspective which goes beyond a snapshot view by building on the cases of a core group of ten OECD countries, this timely book investigates the ways in which important new developments impacting on higher education crystallise around the lifelong learning agenda:new technology and open source resources;the changing role of the state and market in higher education;the blurring of public and private boundaries;issues of equity and access in a time of global economic turmoil;the increased emphasis on research and international league tables;the changing nature of the education; and, the complex interaction of international, national and regional expectations which governments and other stakeholders have of universities and other public and private institutions of higher education. While focussing on the situation in Canada, USA, Japan, Australia, New Zealand and a wide variety of European countries, the book also assesses the issues from the perspective of developing countries.